1. Combine petite diced tomatoes, black beans, corn, chicken broth, salt, black pepper, green onions, garlic powder and cumin in slow cooker. Season chicken with salt and lay on top. 1. Cook on low for 6-7 hours or on high for 4 hours. A half hour before serving, remove chicken and shred. Return chicken to slow cooker and stir to combine. 1. 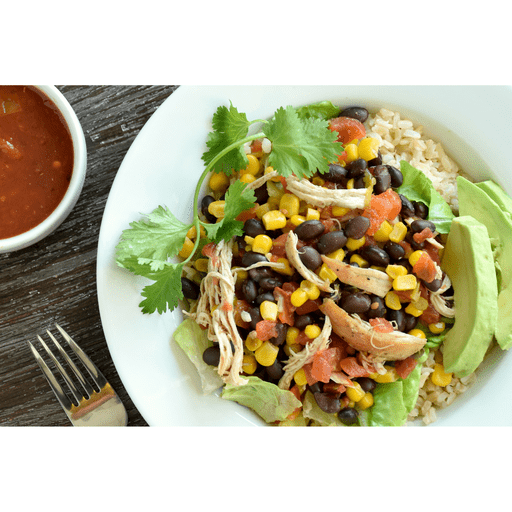 Serve over rice and top with salsa, chopped romaine lettuce, chopped cilantro and avocado slices, if desired. Calories 290, Total Fat 2.5g (Saturated 0g, Trans 0g), Cholesterol 50mg, Sodium 690mg, Total Carbohydrate 38g (Dietary Fiber 5g, Sugars 5g), Protein 27g, Vitamin A 4%, Vitamin C 10%, Calcium 6%, Iron 10% *Nutritional values are an approximation. Actual nutritional values may vary due to preparation techniques, variations related to suppliers, regional and seasonal differences, or rounding.